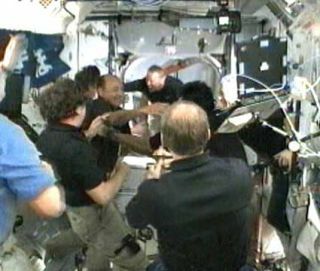 The Expedition 20 crew welcomes the crew of STS-127 aboard the International Space Station after the two vehicles docked Friday. The International Space Station is now more crowded thanit's ever been before, with a record number of 13 people onboard. The populationboost came from the influx of seven newcomers aboard the space shuttleEndeavour, which dockedFriday at 1:47 p.m. EDT (1747 GMT), and opened its hatch into the station acouple hours later. Space station commander Gennady Padalka, a Russiancosmonaut, rang a ceremonial bell to signal the arrival of the new ship and greetedthe shuttle astronauts as they floated through the door. "This is a remarkable event for the whole spaceprogram,? Padalka said. "Welcome, we are very happy." "The crewof STS-127 is extremely happy to be here," replied Endeavour's STS-127commander Mark Polansky. "Thirteen is a pretty big number but it's goingto be an outstanding visit for us." Polansky came with pilot Doug Hurley, and missionspecialists Chris Cassidy, Julie Payette, Tom Marshburn, Tim Kopra and DaveWolf. Waiting onboard the station with Padalka were Roman Romanenko, MichaelBarratt, Robert Thirsk, Frank De Winne and Koichi Wakata. Kopra is slated to take Wakata's spot as an ISS Expedition20 flight engineer, with Wakata returning to Earth aboard Endeavour. Theexchange is more than a month overdue because of delays pushing backEndeavour's launch. "Maybe Koichi is looking forward to a hot shower backhome," Polansky suggested. While there have been 13 in space at the same time in thepast, they have been spread out over separate vehicles. Today is the first timeone spacecraft has hosted such a large population. "It's pretty exciting to have 13 crewmembers onboardthe space station," Wakata said after they arrived. "What a greatday." Though the population jump might make for some traffic inthe close quarters of the space station, the astronauts are prepared to geta lot done during the two-week stay of Endeavour. A major goal is toinstall the final segment of the huge Japanese Kibo laboratory - an exposedporch for outdoor science research. "It's a lot different from what I remember last timebut we're having a blast and looking forward to some hard work," saidPolansky, who is making his third visit to the ISS. The visit will also reunite two Canadians - Robert Thirskand Julie Payette - who are the first two Canadian Space Agency astronauts tobe in space at once. "This?ll be the first time that two Canadian astronautshave been on orbit. It?ll be very good to see Julie and her crewmates duringthe Endeavour mission," Thirsk said in a preflight interview.